What the Bosch 4100-10? It provides, is a full-service portable table saw with numerous bells and whistles. It is sleek and easily hefted by convenient handles and the gravity rise stand works quite handily. With built-in wheels on the stand, the whole contraption converts into something akin to a dolly for easy relocation of the table saw. The 15 amp 3650 rpm motor of the Bosch 4100-10, isn’t too dissimilar from other portable models, albeit on the upper end of power for its class. 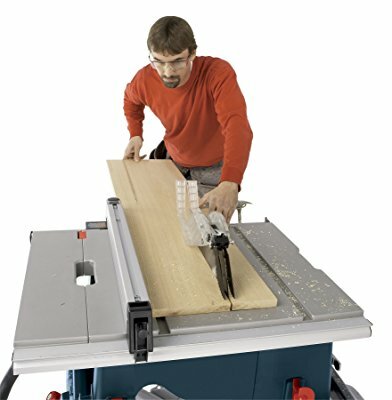 Where the Bosch 4100-10 really sets itself apart isn’t in the standards of what table saws offer, it’s in the way it executes them. The 21-1/2-inch square tabletop and 25-inch rip capacity give this saw more cutting room than any table saw in its class. Sheet goods and larger stock are handled easily. 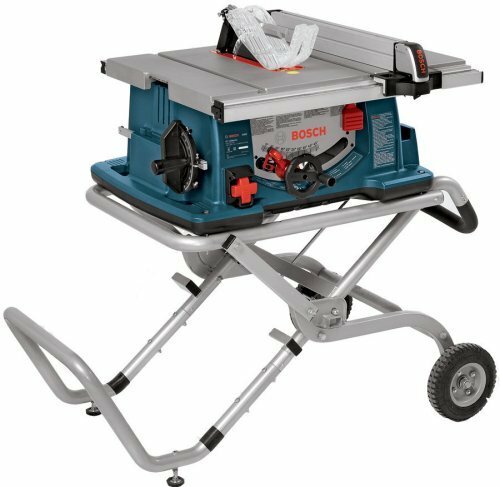 Of course, the Bosch 4100-09 handles all standard materials including hardwoods without the ugly burn that other table saws may cause. As a Bosch product the 4100-10 table saw comes with an unconditional 1-year warranty on parts, 30-day money back guarantee, and a 1-year service protection plan. All things considered, the Bosch 4100-10 is an excellent buy. At first, the price may seem steep considering that the DEWALT DW745 (which I reviewed here)can get the job done for about 30% less. And while the Dewalt DW745 is an excellent table saw in its own right, the additional features of the Bosch 4100-10 are well worth paying for in my opinion. You get about twice as much rip capacity, the extremely handy gravity rise stand, and the added convenience of on-saw tool storage. There aren’t many cons you can find about 4100-10 model. Its only competition is Dewalt DW745 and if I tell you the truth, I wasn’t sure which of them to place on the no.1 spot on our list of recommendations. Both of them are great buys, but in the end, it all comes down to personal preference.